TEKDON, INC. is a leading manufacturer of printed glass microscope slides including our proprietary PTFE/Teflon™ printed slide which prevents cross contamination and increases microliter capacities. The microscope slides provide a wettable (hydrophilic) well area which enhances cell attachment and spreading capabilities while the coating retains its hydrophobic characteristics. Microscope slides are also available with epoxy, silane and poly-l-lysine adhesive coatings along with a complete line of frosted end glass microscope slides, cover glass and blotters. TEKDON supplies printed microscope slides to great organizations of research facilities, medical research facilities, pharmaceutical research laboratories, cosmetic research facilities, university laboratories, corporate laboratories, veterinarian laboratories, crime labs, Immunofluorescent assay kit manufacturers, medical laboratory distributors, and many more. EXTREMELY HYDROPHOBIC for controlling cross contamination and increasing microliter capacity. Chemically resistant and acetone proof. Hydrophobic, chemically resistant and acetone proof. Adheres tissue sections and cells to the glass without the need for special adhesives or protein coatings. are precleaned white glass, optically clear, with wettable glass surface for enhanced cell attachment and spreading capabilities. Microscope Slides measure 75 x 25 x 1 mm plain or frosted end. We can make slides with customized well formations or other features. Need your company logo or trademark on the printed mask? No problem, we can do that at no additional charge. At TEKDON, our production facility is state of the art. Production lines are completely automated implementing cleaning stations and digitally controlled printing processes unlike any others for printed microscope slides. All precision glass microscope slides are manufactured incorporating computer driven "VISION SYSTEMS". This enables TEKDON to detect imperfections in microscope slides that the human eye may not, allowing for the ultimate in quality control for our customers. In addition to the visual inspection of the glass, printed mask and well locations, the microscope slides are consistently monitored for hydrophobicity, solvent resistance and wettable well areas. View the general outline of Tekdon's Quality Assurance Process. TEKDON, INC. does not inventory printed microscope slides. 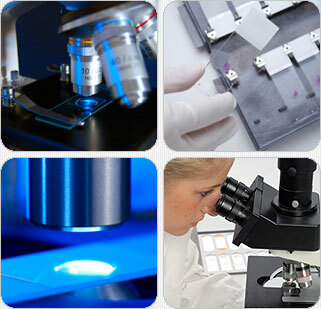 All microscope slides are manufactured as ordered to insure maximum shelf life and glass cleanliness. Depending upon production schedules, printed microscope slides are ready for delivery after QA within 3-4 weeks. If you should require your order sooner, please don't hesitate to ask our customer service personnel. Rush orders are available and we'll see to it that you receive your microscope slides in a timely manner. Teflon™ is a trademark of The Chemours Company FC, LLC, used under license by Tekdon Inc.
TEKDON, INC. offers state-of-the-art screen making services specializing and catering to the cosmetic, pharmaceutical and laboratory glassware and plastic decorating industries. 40521 State Road 64 E.
Copyright © 2003-2019 TEKDON, INC. All Rights Reserved. Content may not be duplicated, copied, distributed, transferred, or used in any way without expressed written consent from TEKDON, INC.